21" x 11" x 13"
JEGS offers a high-performance, affordable Plasma Cutter suitable for hobby and professional use. 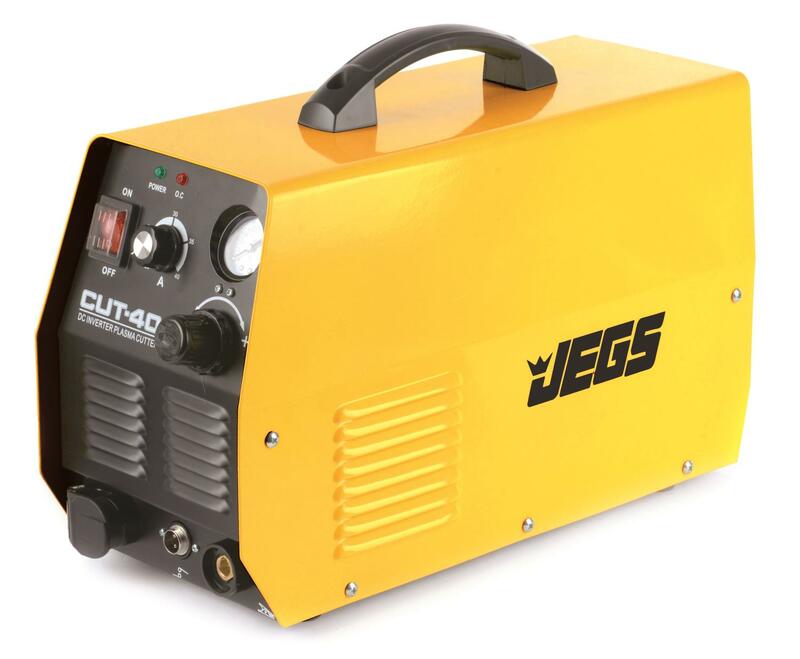 JEGS 40-Amp Plasma Cutter allows you to cut metal the easy way. It can cut up to 3/8 in. mild steel and has a variable output regulator. This Plasma Cutter includes a hand torch with cable, ground cable with clamp, and the power cord; replacement parts kit available. When cutting be sure to use caution and extreme care. JEGS Complete Kits are a one-stop shop for some of the most common automotive applications. Save time and money, and benefit from the experience of the high-performance enthusiasts at JEGS. 81545 is rated 4.6 out of 5 by 73. Rated 5 out of 5 by K5ADDICTION from Great product. Been using it trouble free for about three weeks now and it performs flawlessly. It's a true bargain. Rated 5 out of 5 by Johns rods from Must have for any shop I didn’t want to spend a ton of money on my first plasma cutter and after reading other reviews I decided on this duel voltage one. Was everything I hoped for and more. Easy to set up and use and with a little practice I’m pretty good and confident in my work with it now. My first project with it was rocker panels on a 71 bronco. Made removal of the old ones a breeze. Would recommend this to anyone thinking of sheet metal projects and restorations. Rated 5 out of 5 by Jon25 from Great little plasma cutter I've had this plasma cutter for a couple weeks now and it's so much easier and cleaner than using the old torch setup. Great price too! Rated 5 out of 5 by ConcreteCowboy from Absolutely worth it! I bought this plasma cutter when I started building my hot rod last year. I can honestly say this thing is awesome. I can slice through 3/16” steel (on 230V power supply) like it’s nothing. With some practice I am now able to cut great asymetric shapes so much easier than using my oxy-acetylene rig. Rated 5 out of 5 by Rnelson664 from Great deal! I’ve looked at other plasma cutters in this price range and the reviews were always terrible. When I saw the low price of this Jeg’s plasma cutter I expected the same poor reviews. But instead, the reviews were mostly favorable so I took a chance. I’ve used it twice and it works like a charm! What a great product at an incredible price! Way to go Jegs!!!! Rated 5 out of 5 by C4clewis from Works great Cuts metal great on 100v. It does require a good amount of air to function properly, so e sure you have a good compressor/tank. Cuts 1/4" steel okay on 110v, I don't have 220v right now but can only imagine this would be a beast. I had no problems with air leaks. Took it out of the box and fired it right up. No, we do not currently have a guide available for the plasma cutter. No, this does not have a port for a remote port on it. Will you accept a check and then mail after it is cleared? You can mail us in the order with a check or call us to use a check by phone. Can I get consumables at the local welding store, or do I need to order from jegs every time? These supplies would be available at most welding supply locations, and we will keep them on hand here. This will depend on the thickness of the metal, your compressor will work for most applications. It says I need to order the blower. What is that for? That is just to clear the air of the smoke and fumes from welding or cutting. Is there a gouging tip ( for gouging out welds)? &nbsp;Or is it just a cutting tip? This plasma cutter comes with a cutting tip only.